Providing consistent and reliable active power to the grid is the result of very careful coordination between generator owners and system planners. Stable and consistent active power is a challenge for photovoltaic solar power providers because their source of power fluctuates. Accurate predictions can be made to estimate the irradiance which will be available over the course of a calendar year and even month-by-month, but we ultimately have no control over the weather. There is a practical method to mitigate the loss of power despite overcast or cloudy days; Utility-scale PV solar facilities can be sized bigger than needed, only the power that is promised to the off-taker is inverted and provided to the grid. 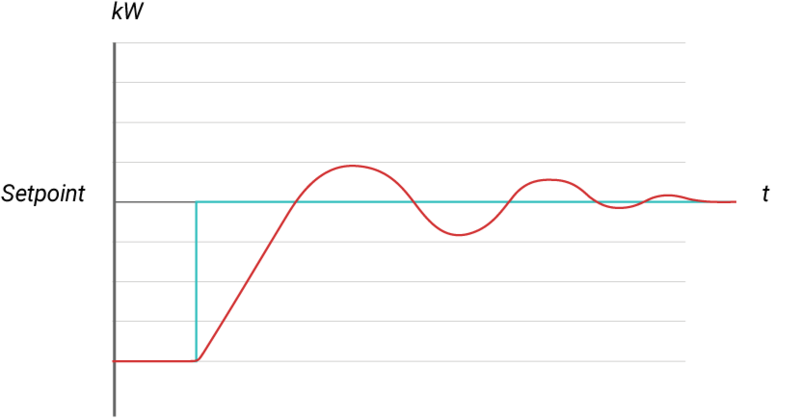 When partial cloud cover shades the field, or if a couple of inverters are out of service, the closed-loop feedback from the point-of-interconnect will indicate to the controller that power has dipped below the threshold. The controller will increase its demand from the available inverters to compensate for the loss. The available inverters can individually increase their output until the plant reaches its combined goal. The ability to reach that setpoint still depends on the sun’s irradiance, but by oversizing the plant, partial cover or a couple downed inverters aren’t usually a problem. The bigger challenge is preventing the power output from overshooting the setpoint when the clouds shift, and the full irradiance of the sun instantly boosts the plants potential. Suddenly those inverters, working a little harder in the shade, are dangerously capable of rapidly exceeding the target setpoint. Before the controller has time to respond, the output may balloon out of control. 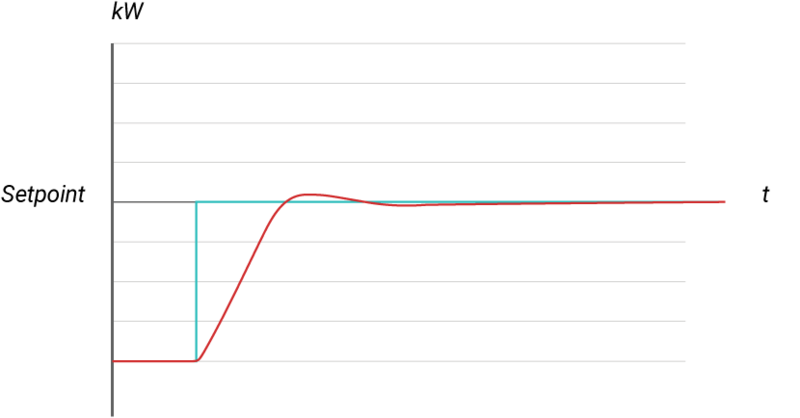 By the time the controller perceives the spike its peaked well above the setpoint. The controller quickly reduces its demand, but the response is also subject to lag, and the controller can undershoot the reduction. 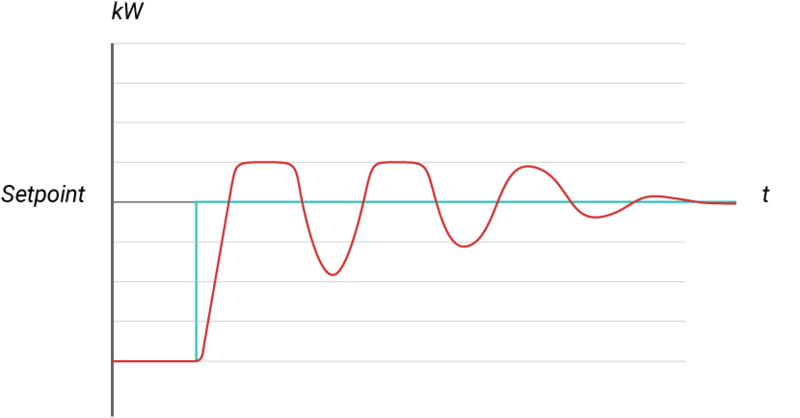 This oscillation is made worse by the delay caused by inverters’ internal processing and velocity limitations. The controller commands the inverters to change, and the inverters change incrementally at their own internal rate. A poorly tuned controller can respond to the perceived lack of response more aggressively. These oscillations can cause stability issues. While ideally SCADA software and equipment will be selected and configured to reduce the data latency, the controller can be fine-tuned to contend with feedback-lag without losing control. The controller is compelled to produce equilibrium. Its summed error, used to calculate positive and negative corrections, end up cancelling each other out in intensity over time, like a swinging pendulum. Without enough sunlight to ever reach a setpoint, an unregulated controller would add up a run-away error. The resulting demand, unchecked, will overshoot the setpoint aggressively when the sun returns. The controller output can be capped to predetermined limit (~5%-15% above the setpoint) By limiting the controllers output, it will limit PID windup. This also helps control how much overshoot can occur. Taking advantage of ramp rate control, which is built into the inverters, can be a significant aid in limiting overshoot. Setting ramp rates at the inverter will control how fast generation will ramp up when a rapid increase in irradiance occurs. The flip side, is that it increases system response time. Plant controller tuning needs to take this into consideration. By fine tuning the controller to incorporate all the limitations and risks associated with its design, the ideal output can be reached. 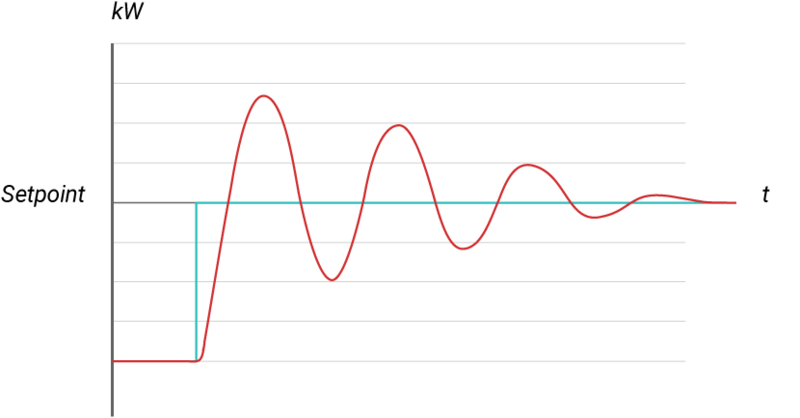 An output where overshoot is minimal without any system oscillations; The system response time is controlled and predictable. There will always be factors outside of the control of the PV Solar power provider. 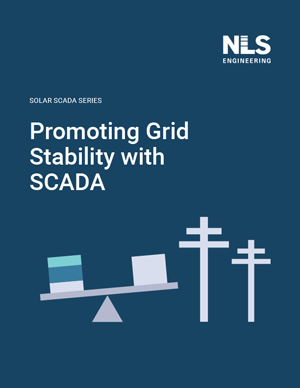 With careful considerations, SCADA design can mitigate, manage and maintain an active power output and provide consistent and reliable support to the grid.